Background: The purpose of this study was to investigate two-body wear resistance and hardness of different three modern composite materials. Methods: In the conditions recommended by the manufacturer five pieces were produced from each material. All samples were kept in distill water for 1 week and determined Vickers hardness (HV) before two-body wear test. Then, two-body wear tests were performed using a computer controlled chewing simulator. In this study, the chewing simulator was programmed to provide a 2 mm vertical movement and a 0.7 mm horizontal movement. For each wear test, Al2O3 with a diameter of 6 mm was used as antagonist material. The mean volume loss of all samples after the wear tests was determined with three dimensional profilometry. In addition to a random specimen was selected from each test group and SEM images were taken for analysis of wear tracks. Mean and standard deviation values were calculated and evaluated with the one-way ANOVA. Results: The hardness values of the materials tested in this study were measured between about 49 HV and 78 HV. Significantly, lowest mean volume loss was detected for the Heliomolar at about 3.1 μm3 whereas the highest mean volume loss was detected for the Silorane at about 6.4 μm3 after 360.000 chewing cycles. Conclusions: However, among the materials tested in this study suggested correlations between HV and two-body wear resistance are not significant. In clinical trials, the use of light-activated composite restorative materials has been increasing consistently in recent years. Dental composites are materials containing multiple structures that it usually consists of inorganic filler, resin matrix, and silane coupling agents. The filler particle size of the composite material determines the type of resin matrix and material gives many superior properties. Mechanical and biological properties of composite materials affect many parameters such as thermal change, corrosive, and mechanical loading in the intraoral trilogy. Intraoral tribology wear can be defined as the net loss of volume, which occurs as a result of the interaction of two surfaces. In intraoral tribology, it is possible to mention about four basic mechanisms of wear. These wear mechanisms includes two-body wear (attrition or occlusal contact area), three-body wear (abrasion or occlusal contact free), fatigue wear, and corrosive wear. In intraoral tribology, these wear mechanisms can occur alone or in combination. In the literature, it is reported that two-body wear and three-body abrasive wear for composite restorative materials is the basic wear mechanism. Wear in intraoral tribology is a process that depends on many factors such as component of the restorative material, the abrasive effect of food, the structure of antagonist material and chewing behavior. Severalin vitro test methods have been developed for the restoration of materials in the literature for about 40 years. However, nonein vitro test method can completely simulate, due to the complex nature intraoral tribology. As well as different characteristics of chewing simulators such as loading force, thermal temperature changes, and frequency that it reduces the correlation between the results obtained in these studies. However, in 2001, the standard parameters were established for two-body wear and three-body testing with a technical ISO specification. In this specification, the abilities of the chewing simulator and the experimental parameters are determined. The chewing simulator used in this study has the capability of three different chewing simulations in the ISO 2001 technical specification. The purpose in this study was to investigate two-body wear resistance rate and hardness of three different filler type composite materials. Restorative composite materials tested in this study are shown in [Table 1] (information provided by the manufacturer company). For the investigation to dental materials, the chewing simulator device capable of simulating the artificial mouth environment was designed and produced by the research group. [Figure 1] systematically represents the dual axis movement of the chewing simulator. Chewing simulator performed load 50N in the vertical axis and 0.7 mm horizontal axial movement when the antagonist material touches the specimens. (detection was performed with magnetic sensor) When the loading effect on the vertical axis on the specimen is unloading, specimen returns to the starting point again [Figure 1]c. Thus, during the chewing tests, wear was formed in the same region of the material surface. In this study, five specimens from each material were produced under conditions recommended by the manufacturer. (8 mm height × 4 mm diameter) All specimens were kept in distill water for 1 week before two-body wear tests. Then all specimen surfaces finished with 600, 1500, and 4000 grit SiC abrasive papers and determined Vickers hardness (HV). Al2O3 material (6 mm diameter) was used in each chewing test as antagonist material. Each specimen was subjected to chewing test (50N, 360,000 mechanical cycles 1.2 Hz and between 5°C and 55°C 6000 thermal cycles 5 min/cycle). The mean volume loss of the specimens were measured after each chewing tests. (use with three dimensional noncontact profilometer– Bruker Contour) In addition to a random specimen was selected from each test group and scanning electron microscopy (SEM) images were taken for analysis of wear tracks. (SEM-Zeiss Sigma 300). Data were analyzed using statistical software (SPSS Statics 20.0 for Windows 64 bit; SPSS Inc., Chicago, USA; license by Ataturk University) Means and standard deviations of HV, filler volume and volume loss were calculated and analysis using one-way ANOVA. [Table 2] shows the mean HV values of the composite materials tested in this study. The mean HV value was at the lowest material micro-filled Heliomolar composite, whereas the highest was determined at the material micro-hybrid Grandio composite. [Figure 2] depicts the mean volume loss of the materials tested in this study after 360,000 chewing cycle tests. [Figure 3] shows the SEM image of the randomly selected specimen from each group. 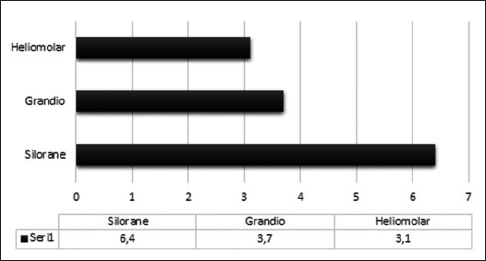 Silorane composite material wear tracks are more pronounced than Heliomolar and Grandio composites [Figure 3]a. Heliomolar has a very smooth surface after chewing tests. However, some micro-cracks appeared in the direction of the wear tracks. These micro-cracks may have continued from the subsurface of the material due to repetitive mechanical loading. Grandio material has a rougher surface than Heliomolar composite. In addition, due to the large glass particles being displaced in the material that it occurred holes of along the wear tracks on the material surface [Figure 3]c.
In this study, restorative composite materials with three different filler types were tested in 360,000 chewing cycles using chewing simulator device. The improvements in particle size contained in the dental composite material produced a chemical composition containing two different particles. These materials are called micro- or nano-hybrid resin composites depending on the size and content of micro- or nano-particle. In addition, such resin composites are called universal. Commercially, it is often difficult to distinguish between micro- and nano-hybrids because of both the microstructure and mechanical properties tend to be similar. The tested dental composite materials are available at the market and widely used in dental treatment. It has been reported in the literature that many test devices can perform two-body wear and three-body wear mechanisms., Both of them are accepted simulator models forin vitro wear testing. When the two simulator models are compared; in the case of type two-body wear mechanism, wear occurs with direct contact of between test specimens and antagonist specimens, whereas in type three-body wear occurs with abrasive slurry (for example poppy seed or p-methoxymethamphetamine as third-body) between the test specimens and antagonistic specimens. Wear is a process depending on many parameters restorative material type, oral environment, the amount of applied vertical force, horizontal wear distance and antagonist structure can play an important role. In this study for chewing tests 6 mm diameter Al2O3 material was used as antagonist material. The force produced by the chewing simulator should be similar to the chewing forces produced in the oral environment. Studies in the literature have shown that tooth and the dental material is normally loaded between 20 N and 120 N in the oral environment. A force of 50 N value applied in this study appears to be an average value in the literature. In addition, contact time (400–600 ms), loading frequency and number, thermal change temperature, and dwell time are the important factors affecting wear of composite material. It has been reported in the literature that the number of mechanical cycles in chewing simulators varies between 50.000 and 1.200.000 in vivo study it has been reported that the average number of chewing varies between 300 and 700. The numbers of 360,000 mastication cycles in this study were corresponding approximately 1.5 year and 2 yearsin vivo study. The chewing simulator was programmed to perform a 2 mm vertical movement and a 0.7 mm lateral movement during the experiment and the frequency of load cycle at 1.2 Hz. In the literature, experimental data on two-body wear mechanism are very limited. Therefore, in this study, purpose investigate two-body wear resistance and hardness of three different kinds of modern composite restorative materials. All specimens were stored in 37°C distill water for 7 days before the mastication tests. Water absorption has an effect on the mechanical properties of composite materials. It has been observed that this stored period affects the mechanical properties of the material such as wear resistance, hardness, tensile strength. The previous study reported that the specimens is significantly increased two-body and three-body wear resistance and hardness in the 7 days stored distil water compared to the after 24-h exposure to distil water only., According to Chadwich et al. composite restorative materials did not show significant differences in wear after 1 week and 1 year of water storage. For this reason, it can be assumed that the composite material is completely saturated with the distilled 1 week distilled water. In this study, Heliomolar and Grandio composite materials showed similar two-body wear resistances. It is seen in the literature that these two materials exhibit similar two-body wear characteristics. This may be due to the fact that these two materials have similar monomer structure. Although Heliomolar and Silorane composites have almost equal filler weight, Heliomolar exhibited better two-body wear resistance. The results of this study indicated that the composite resin has been filler volume did not significantly affect the amount mean volume loss of two-body wear tests. Heliomolar composite is characterized by a very smooth and uniformly worn surface [Figure 3]b. This can be explained as Heliomolar composite could most likely be attributed to the unique polymer structure. Moreover, small voids are seen on the entire surface of this material along the edges. This is because mechanical impacts of vertical loading cause plastic deformation in the composite material. This can be explained as the sliding motion of the particles that are snapped of the material wears surface. When comparing the occurred mean volume loss values due to wear of Grandio and Heliomolar composite, the two composite materials that the very similar monomer composition with nearly the same filler volume did not have a significant effect on two-body wear rate even though they have different filler types and hardness. In addition to among the materials tested in this study, correlation between hardness and two-body wear resistance was not significant. Within the limitations of this study, it can be concluded that micro-filled and nano-hybrid composite materials exhibit similar two-body wear resistance. SEM analysis after 360,000 mastication cycles shows micro cracks and pits on the surface of the material. These micro-cracks can be the continuation of cracks that occur subsurface of material. This can be suggested as an indication of fatigue wear. Kurachi C, Tuboy AM, Magalhães DV, Bagnato VS. Hardness evaluation of a dental composite polymerized with experimental LED-based devices. Dent Mater 2001;17:309-15. Bicer AZ, Karakis D, Dogan A, Mert F. A comparison of wear rate of direct and indirect resin composites: A two-body wear abrasion test. J Composite Mater 2015;49:2599-607. Lazaridou D, Belli R, Petschelt A, Lohbauer U. Are resin composites suitable replacements for amalgam? A study of two-body wear. Clin Oral Investig 2015;19:1485-92. Mehl C, Scheibner S, Ludwig K, Kern M. Wear of composite resin veneering materials and enamel in a chewing simulator. Dent Mater 2007;23:1382-9. Koottathape N, Takahashi H, Iwasaki N, Kanehira M, Finger WJ. Quantitative wear and wear damage analysis of composite resins in vitro. J Mech Behav Biomed Mater 2014;29:508-16. Souza JC, Bentes AC, Reis K, Gavinha S, Buciumeanu M, Henriques B, et al. Abrasive and sliding wear of resin composites for dental restorations. Tribol Int 2016;102:154-60. Hu X, Marquis PM, Shortall AC. Influence of filler loading on the two-body wear of a dental composite. J Oral Rehabil 2003;30:729-37. Knobloch LA, Kerby RE, Seghi R, van Putten M. Two-body wear resistance and degree of conversion of laboratory-processed composite materials. Int J Prosthodont 1999;12:432-8. Heintze SD. How to qualify and validate wear simulation devices and methods. Dent Mater 2006;22:712-34. Yap AU, Teoh SH, Tan KB. Influence of water exposure on three-body wear of composite restoratives. J Biomed Mater Res 2000;53:547-53. Yilmaz E, Sadeler R. Effect of thermal cycling and microhardness on roughness of composite restorative materials. J Restorative Dent 2016;4:93-6. Chadwick RG, McCabe JF, Walls AW, Storer R. The effect of storage media upon the surface microhardness and abrasion resistance of three composites. Dent Mater 1990;6:123-8. Koottathape N, Takahashi H, Iwasaki N, Kanehira M, Finger WJ. Two- and three-body wear of composite resins. Dent Mater 2012;28:1261-70. Hahnel S, Schultz S, Trempler C, Ach B, Handel G, Rosentritt M. Two-body wear of dental restorative materials. J Mech Behav Biomed Mater 2011;4:237-44.